Choosing the correct and most suitable immigration classification and category when initiating and applying for green card status in and to the U.S. is extremely important. Depending on the type and/or classification of the green card, the wait time to obtain green card status varies tremendously, and the difference can be several months, to several years or even decades. Immigrating to the U.S. via sponsorships through certain skill sets or employment are effective ways to legally and permanently live and work in the U.S., or gain legal permanent residency status in the U.S.
1. Many employment-based green card cases require sponsorships by employers. Other employment-based green card cases do not require the sponsorships of any specific employers, and can be self-petitions or self-sponsorships by the foreign national themselves. a) For example, an EB-3 green card case requires the sponsorship by an employer. b) On the other hand, an EB-2 national interest waiver green card case that is based on the foreign national’s contribution to the industry does not require direct sponsorship by an employer. c) An EB-1 extraordinary ability green card case is a self-petition immigration case, and does not require the sponsorship by an employer. Certain EB-1 green card cases require the sponsorship by an employer. 2. The wait time for green card cases for the various employment-based preference categories or cases can vary widely, ranging from several weeks or several months, to almost 9 years, because their wait time are tied to the employment-based preference category and the foreign national beneficiary’s country of birth (not nationality). a) For example, the wait time to receive a green card based on an EB-1 case is tremendously shorter (e.g. several months or weeks , or longer depending on each case) than an EB-3 case (many years) because immigrant visa numbers are often more readily available for an EB-1 than an EB-3 case. Also, the wait time for an EB-2 national interest waiver case is tremendously shorter (e.g. several months or weeks, or longer depending on each case) for native from many countries (not all). b) For example, under an EB-2 case based on PERM, it takes substantially longer for a foreign national who was born in India or China to receive his/her green card (several years) than a foreign national who was born in other countries. c) However, if a foreign national who was born in India or China is eligible and is applying for an EB-1 green card case, the wait time will be tremendously shortened. d) Other than a bona-fide/genuine/good-faith marriage to a U.S. citizen, having relatives to provide immigration sponsorships to foreign nationals are by no means good solutions. Certain family-based green card sponsorships could take decades to come through. 3. Moreover, green card processing time at various government agencies changes from time to time, depending on diverse factors such as their immigration case load, the number of green card applicants in a given period, new law and/or policies. a) The processing time for various employment-based green card categories can retrogress (e.g. taking much longer than the government’s previously estimated processing time). b) For example, the processing time for many EB-3 green card cases retrogressed from a processing time of about 8.5 years in April 2009, to a sudden halt (no processing) for the month of May 2009 when immigrant visa numbers became unavailable for May 2009. The U.S. Citizenship and Immigration Services (“USCIS”) cannot adjudicate green card I-485 adjustment of status cases without the available immigrant visa numbers. 4. Some foreign nationals are deterred and discouraged by the dampening economy from, or their dim view in securing U.S. employment, and/or immigration or green card sponsorships. a) For foreign nationals who do not have or wish to secure immigration sponsorships by U.S. employers, being able to apply for employment-based green card by themselves without any specific employers (i.e. self petitions or self sponsorships) can make a huge difference in their lives. For example, the differences of either falling into illegal immigration status in the U.S.; not coming or immigrating to the U.S. or having to leave the U.S. (most often, after years of being in the U.S. with established social circles and families here); or the privileges and opportunities to live anywhere in the U.S. with U.S. permanent residency status, and eventually, the opportunity to apply for U.S. citizenships. In summary, choosing the most effective category of green card cases means the difference of waiting decades for your green card, to several months or weeks. Having a green card much sooner also means having the opportunities to choose to live and work anywhere in the U.S., and eventually, to apply to be a U.S. citizen. We represent companies, and individuals and their families in U.S. immigration law such as green card, work visa and waiver matters. We represent clients within the U.S. and abroad. 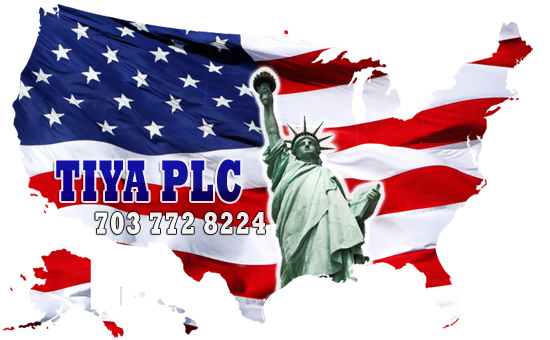 PLEASE VISIT OUR WEBSITES AT http://www.tiyaimmigration.com AND http://tiyalaw.blogspot.com , THANK YOU.